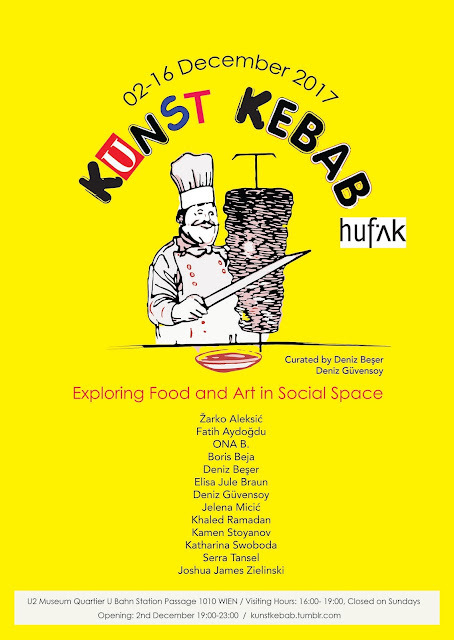 Kunst Kebab, an international art exhibition, which focuses on the relation of food and art will take place in a Kebab Restaurant in the U2 Underground Passage in the Museum Quartier, Vienna. The restaurant, which is run by a Turkish immigrant, will be a site for artistic interventions and it will include artworks of different media such as digital printing, photography, installation, painting, video and performance. The exhibition is hosting 13 artists from different backgrounds and it is curated by Deniz Beşer and Deniz Güvensoy.